Welcome to a scientific analysis of a miracle. This is a case of singular uniqueness — showing an extension of human consciousness not yet accepted by science and that can be scientifically measured and analyzed. Click on the link below to see our presentation at a respected psychiatric meeting. If accepted by science it opens the doors for science’s serious inquire into the miracles of Sai Baba. I am presenting the case in short sections to help us understand its uniqueness — and to get your feedback. We have made a 20 minute documentary introducing this case to scientists. Here is it’s trailer. Sign our email list below to be notified of future posts. POST #2 INTRODUCTION I have presented this case to the annual meeting of the American Psychiatric Association, the most prestigious psychiatric meeting in the world in May 2013, and again, in a 3 hour media workshop in Toronto Canada in May 2015. Click on the link above to see some of our presentation at the Toronto meeting. As this is the first Sai miracle that I know of that is being presented to science, there will be obstacles that only Sai Ganesh can overcome. This post continues our introduction to the case and identifies Parabrahman, infinite consciousness, as the voice presenting the messages to my patient Jackie. POST #3 A CLOSE LOOK AT MESSAGE 1 We take a close look at message 1 to show the profound wisdom and unique complexity contained in the message. The unique and novel construction of this complex message is compelling evidence that my patient Jackie had no prior knowledge of this material. POST #4 INTRODUCING ONE OF OUR SANSKRIT SCHOLARS See the extent of training needed to adequately analyze these messages in depth. POST #5 DIFFERENT TRADITIONS – DIFFERENT LANGUAGES Here we take a deeper look at the unique complexity of languages and concepts found in these messages. POST #6 AN UNUSUAL SIGNATURE Where are these messages coming from? Here we see his signature on the first message. POST #7 HER DISABILITY — HIS MESSAGE Here we begin to establish the extent of my patient’s disability and observe the profound wisdom coming to her. POST #9 NO PRIOR KNOWLEDGE OF SANSKRIT – IN HER OWN WORDS Here we look at Jackie’s background and genuine bewilderment from what she reports as visitations and messages from Sai Baba. This is compelling evidence that this extraordinary and never before proved expanded level of consciousness is actually happening to Jackie. Click here for all audio chapters of the “Holy Man” book. 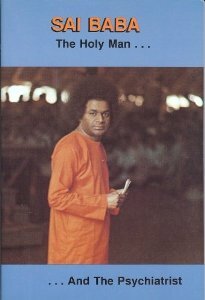 Click here for audio chapters of the “With Love Man Is God” book. Click here to buy the “Holy Man” book for Kindle from Amazon. Click here to read FREE the “With Love Man Is God” book.